(Tropaeolum minus) Red, orange, salmon, and yellow flowers are boldly displayed upon bushes of thick green, round leaves. Makes a beautiful border plant. 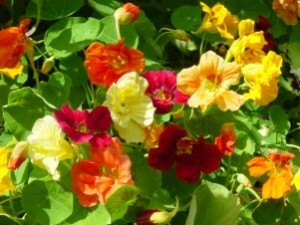 Salad-savvy adults have probably enjoyed the peppery tang of nasturtium leaves and edible flowers among their greens.